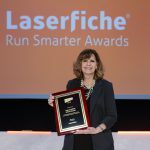 LONG BEACH, CA (March 20, 2014)—Laserfiche has been granted a 5-Star rating in the CRN 2014 Partner Program Guide. The 5-Star Partner Program rating recognizes an elite subset of companies that offer solution providers the best partnering elements in their channel programs. To determine the 2014 5-Star recipients, The Channel Company’s research team assessed applications based on investments in program offerings, partner profitability, partner training, education and support, marketing programs and resources, sales support and communication.